“There is something about the outside of a horse that is good for the inside of a man.” This famous quote by Winston Churchill, touches upon that mysterious something that draws people to the horse in ways words cannot explain. What is it about the horse that effects people so profoundly, no matter what their involvement? I have yet to hear anyone say that they do not like horses – dogs and cats, maybe, but not horses. They always have a story to tell about something that happened to them that involved a horse. Most children pass through a “horse crazy” stage and some never get out. My father-in-law grew up farming with the cheapest horses his dad could find. “Cheap” because through mistreatment by past owners, they had figured out how to protest work by laying down in the field and not getting back up … None of this he blamed on the horses themselves and he has a lasting love and respect for them. Today, there is nothing he seems to enjoy more than being with our horses. Wild horses died out in North America 10,000 years ago. They thrived in Eastern Europe and Central Asia, where it is believed horses were first looked at less as dinner and more as a tool and partner. It is thought that horses arrived back into North America through the Spanish coming from the south. The Native American Indians are thought to have acquired them before the revolt against the Spanish in New Mexico in 1680. Because of their versatility and usefulness, horses were greatly desired and spread quickly through the United States and Canada. Horses made it much easier for the Plains Indians to hunt and follow buffalo. Before horses, moving with the buffalo was limited as they originally traveled by human and dog power. Travel, trade, play, work and wars have all been profoundly shaped by our use of horses. It opened up much of the American West by making it possible to travel vast distances and pull loads. Horses brought goods to areas normally hard to reach geographically. They have allowed us to farm larger areas and provide food for more people and animals. In war, the addition of horses changed the balance of power between civilizations. When both sides had horses, tactics and strength, played the major part in battles. Many of the movements we see the Spanish Riding Schools Lipizzaner horses perform today are derived from war maneuvers. Over the last Century, people transitioned away from using horses mainly for work, which caused a sharp decline in their numbers. Today the number of horses in the world has climbed to 58 million and many of them are now used for more recreational purposes. Although, many people still find using horses for ranching, farming, logging, and transportation to be rewarding, versatile and less invasive in many ways. Cultures in other parts of the world still rely heavily on horses for all parts of their lives. The following 2005 statistics taken from a comprehensive and thorough study initiated by the American Horse Council are very telling about the horse in the United States today. There are 9.2 million horses in the U.S., owned by 2 million people. 4.6 million people are involved in the horse industry as owners, employees, volunteers, and service providers; of those 460,000 are in full time paid positions; 702,000 when you add in part-time and seasonal positions. With the addition of spending by suppliers and employees, full time jobs increase to 1.4 million. The direct economic impact on the U.S. economy is $39 billion a year. When indirect spending is added in it reaches $102 billion. The horse industry pays $1.9 billion in taxes to all levels of government. Our total impact on the Gross National Product is $101.5 billion. As far as horse households go, 46% of horse owners have a yearly income of $25,000 to $75,000. 34% are below $50,000 and 28% are above $100,000. Dispels the misperception that horses are for the wealthy, doesn’t it? 70% of horse owners live in communities of under 50,000, but travel to urban areas for showing, training, exhibitions and racing. All 50 states have horses and 45 states have at least 20,000. Horses ridden for recreation top the stats at 3.9 million, followed by showing at 2.7 million and racing at about 844,000. The American Quarter Horse Association (AQHA) realized in the last few years that of its membership, only about 10% actually participated in AQHA shows. 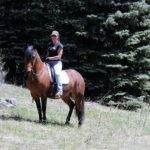 This led to their addition of the trail riding program to log miles and the Versatility Ranch Horse program to give ranch horses breeders a place to showcase their horses. As a state, Colorado produces $956 million in goods and services. 102,400 of us are involved in the industry as horse owners, service providers, employees, and volunteers. There are 5,800 people with full time employment in the horse industry which multiplies to 21,300 jobs when you add those supported through spending by suppliers and employees. 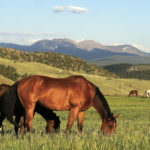 Over seventy percent of Colorado’s 256,000 horses are involved in showing and recreation. Colorado ranks 4th in membership and in number of AQHA owners, only behind the big three states of Texas, Oklahoma and California. With our central location and top class facilities, Colorado hosted 4 of the 5 top AQHA Versatility Ranch Horse shows, International USET competitions, top Dressage and Hunter/Jumper Shows and National competitions for many breeds and disciplines. With the economy, price of feed and no bottom to the horse market, there has not recently been a better time to buy or adopt a horse. Today, you can get a lot more horse flesh and bloodlines for your money than in the past. The qualities that make horses and humans work well together, the wild horse already possessed. They are herd animals and desire to live in groups. They are receptive to people becoming part of their herd and letting them be their leaders. Mentally, their brains work in a way that they desire to learn and obey subtle commands from us. In order to be a good trainer and leader of a horse, we learn to understand and work with their natural instincts, not against them. A good leader is honest, self- confident, respectful, fair, clear and concise and a horses herd behavior paves the way for us to be their leader to train and guide them. Physically, horses are designed to use their powerful bodies to carry a person or to pull a heavy load. Unlike ruminants, who must stop and rest to digest their food, horses can graze and work all day. Horses have a natural gap between their teeth to accept a bit for guiding. Where the nose goes, the body will follow. Additionally, horses can also thrive on a wide variety of climates and feed sources, which makes them able to live most places people do. But there is something more transcendent than just their physical and mental attributes. Widely known Hunter/Jumper trainer, Frank Madden, said recently of the horse, “They are mystical animals and they become so adaptive to whatever situation you put them in. They spoil us and they allow us to become victims of their nobility – to the point where we take them for granted.” One way we take them for granted is that those who are around them all the time may not always be aware of what they do to the inside of us. Just share your horse with some friends or family and watch them be transformed. Therapeutic riding and equine assisted psychotherapy and learning are some of the programs that are tapping into this complex well of healing waters. In our penitentiary in Canon City, prisoners have a program to start Mustangs under saddle to later be sold. The addition of horses to prison settings appears improve behavior of inmates and help reduce recidivism when they leave. Recently, new studies using heart monitors are showing that the heart beat of a human around a horse, will align with that of the horse. Measureable and immeasurable, horses have a profound effect on us. Unexplainable by words, but known by those whose lives have been touched by the horse. Even Jesus is coming back riding a horse – He is definitely a horse nut too! Copyright 2013 Heather McWilliams. Photo by Susan Williams, www.windhorseone.com. New Date for Ranch Race & Western Dressage!!! Thank you to our clinicians and judges for their understanding and willingness to reschedule a new date! Saturday October 5th will be the clinics for the Ranch Race and Western Dressage & the Ranch Race Competition and Western Dressage will run concurrently on Sunday October 6th. All of the information is updated in the Event section on this website. See past Ranch Race’s at YouTube channel “MtnHomes4Horses”. The schedule will remain mostly the same, although we will likely add another Ranch Race clinic on Saturday to keep the groups at about 8 participants. If you would be interested in being in a 8-10am Ranch Race Clinic, please let me know if you were already. The other two for Ranch Race will be at 10am-12pm and 1-3pm. Western Dressage clinics will be at 10am-12pm and 1-3pm. “Lord willing and the creek don’t rise” and “come hell or high water” have taken on new meaning to me! As you can imagine, I have been heavily deliberating about canceling the clinic/show, which is normally not a good idea for many reasons. I think we are now past normal and in light of the above sayings, we are in rain fall amounts in record proportions and all of the complications that come with that. My main concern is for the safety of the people and horses and this is more than just a little rain. I know some of you cannot even get out of your driveway or may not be able to cross Bear Creek to attend. I need to reschedule the insurance, both judges, cattle, both clinicians and so on, so I will plan to have a new date set by this coming Wednesday. I hope you are all safe and somewhat dry! PLEASE PASS THIS ALONG TO ANYONE WHO YOU MAY HAVE FORWARDED ANY OTHER RANCH RACE/WESTERN DRESSAGE INFO TO SO THAT THEY DON’T SHOW UP! Please email me to be put on the Ranch Race email list if you are not already. The beautiful song you hear throughout the Horse Sense Documentary (See post Horse Sense, A Short Documentary with Local Connections) is called, THE HORSE and was written and recorded by Evergreen resident and Nashville recording artist, Pete Martinez. Born and raised in Casper, Wyoming, Pete’s family was full of artistic talent and he learned to play guitar by ear at the age of four. Being fluent in artistic outlets like music and painting, Pete pursued a degree in Mechanical Engineering to, “balance his brain”. He worked on the management side of mining, including helping to set up a gold mine in Peru. More recently in 2007, Pete was named The Maverick by Frontier Airlines’ Wild Blue Yonder Magazine for helping the City of Aurora find a home for their billion dollar water project, Prairie Waters. When not touring or recording, he continues to help farmers, ranchers and municipalities with water issues through his company, Western Water Resources. The story of THE HORSE started in 1996, when Pete was recruited by Fuller & Company, to be a Farm and Ranch real estate broker. During his seven years at Fuller, he became lasting friends with fellow broker Mark Carpenter, Cathy Carpenter Dea’s first husband. When Mark passed away, Pete played at his funeral and then he stepped in again for Cathy to play at her father’s funeral. Years later in July, while driving back from visiting family in Casper, Cathy happened to call Pete and asked if he could come for a barbeque that evening and to bring his guitar. The other guests present were the film crew and producers working on the Horse Sense Documentary. After watching the trailer that night, Cathy asked Pete if he would be interested in writing a theme song. He said he would give it a shot and opportunities for inspiration soon followed. Two trail rides that Pete has been a part of over the years were on his upcoming schedule. The first was a ride in New Mexico that Patrick Swayze, Pete and several friends started on Swayze’s ranch a couple of years before he passed away. The next was at another New Mexico ranch with friends from Santa Fe. The song started to form in his mind as he rode through mountainous ranch country, immersing himself in horse culture and spending time with fellow horsemen. Pulling from his own Spanish blood and the horse traditions that his ancestors brought to the west, he and Cathy knew the song was to be about the legacy of the horse and our bond with them. Seeking help to write the song, he reached out to the legendary singer/songwriter Dean Dillon, who was also on the final trail ride, for potential help on the song. Dillon had to decline with only three days off between September and Christmas but he said to Pete, “I have faith you can do it – go for it!” That was the final push Pete needed to finish the song, making THE HORSE the first song that Pete has written, produced, and recorded without a writing or publishing team in Nashville. Soon after the rides, Pete awoke in Evergreen at 4 am to the first few cords and the melody flowing through his guitar and onto his notepad. In a Denver studio, Pete recorded the song demo and then met with Cathy outside of the Four Seasons to listen to it in his truck – location of the best sound system! The music and lyrics stirred Cathy’s heart. They went inside the hotel to sit down and refine a few of the words and phrases together. Pete recorded it again and they met in Cherry Creek for a final listen in the truck. Then on to Nashville. Prior to his arrival, Pete sent the arrangement to Dave Matthews, his producer in Nashville. Matthews creates the charts for the professional musicians and with the help of the Upright Acoustic Bass, Dobro, Steel Guitar, Fiddle and Acoustic Guitar, they met in the Nashville studio to record THE HORSE. Nashville track in hand, Pete flew back to Denver that night, caught three hours of sleep and the next morning, met the Horse Sense Documentary committee in the Tech Center on October 19, 2012. He performed the song on his guitar and then played the track. THE HORSE was an instant success with the committee and officially became the theme song for the film. You may have heard Pete perform THE HORSE for the first time publically during the opening of the Dancing With Horses program this past January at the National Western Stock Show. He then opened the film premiere of Horse Sense February 18, 2013 at the Denver Museum of Natural and Science Phipps Theatre with a live performance in front of the IMAX screen. Pete considers music his calling, a gift that God gave him and his responsibility to develop that gift to its highest and best potential. He just returned from a month-long promotional tour in Sweden and will be heading back next year for a tour in Sweden and Norway, He now heads to Italy to perform several concerts this September. He is working on three albums presently and can sometimes be heard at open-mic night at the Muddy Buck when he is in town. 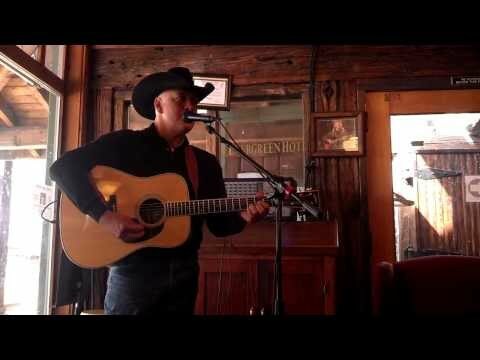 Go to the MtnHomes4Horses YouTube channel to see Pete perform THE HORSE the day of our interview. Be sure to catch his next local performance. Pete has two horses that he ropes off, trail rides and fox hunts. 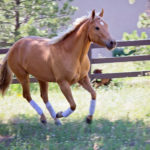 For the article on Horse Sense – A Short Documentary with Local Connections, go to the blog at MtnHomes4Horses.com. Documentary at horsesensedocumentary.com. To contact Pete, hear more music and purchase The Horse go to PeteMartinezUSA.com Heather McWilliams © 2013. In a sunset state of mind.